We’re exceptionally proud of the achievements of our university community. That’s why each year the Plymouth State University Alumni Association honors alumni, faculty, staff, students, and friends for outstanding service to the University, their communities, and other alumni. Know someone who deserves recognition? Submit an award nomination today! The Alumni Association has the privilege of selecting and presenting two sets of awards: Alumni Recognition Awards and The Robert Frost Contemporary American Award. Established in 1978, and modified in 1991, the Alumni Achievement Award recognizes deserving alumni who exemplify the University’s motto Ut prosim (That I may serve) through active participation in and special contribution to the activities of the Plymouth State Alumni Association, their chosen professional field, or the improvement of society in general. 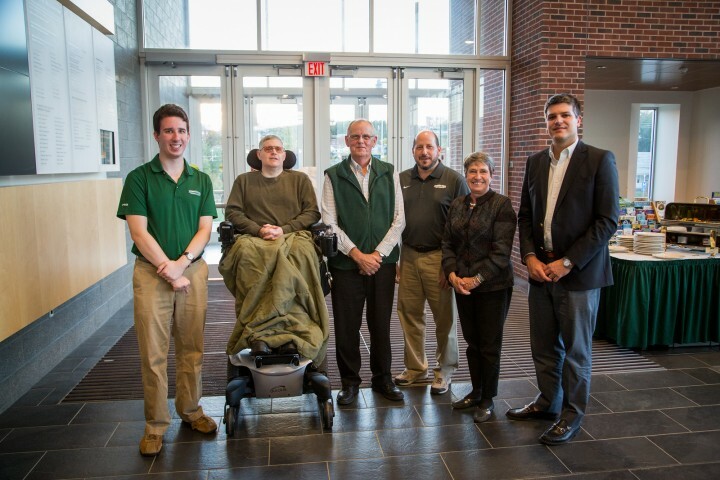 The Distinguished Alumni Service Award, established in 1963, recognizes the graduate who through unselfish devotion and loyalty has served Plymouth State University and/or its alumni organizations. To be eligible, a graduate shall have rendered unusual service in the form of: faithful and continued effort in such areas as maintaining class or other alumni organizations; active participation in alumni or university affairs; and assistance in expanding the usefulness, influence and prestige of the University. Established in 2008, the Faculty/Staff Award of Excellence is awarded to a faculty or staff member who exhibits a commitment to supporting alumni and student connections in a campus environment. Established in 2008, the Graduating Senior Award of Excellence is awarded to a graduating member of the incoming alumni class who exhibits outstanding campus and community leadership while enhancing alumni activities. Established in 2008, the Outstanding Graduate Alumni Award is awarded to a graduate alumnus or alumna who, through earning an advanced degree has been able to impact their profession, community, or society in a positive and meaningful manner. Established in 2008, the Recent Alumni Award of Excellence is awarded to alumni who have graduated within the last 10 years, in recognition of professional excellence and outstanding service to the University, association, community, and/or nation. The Alumni Association’s prestigious Robert Frost Contemporary American Award recognizes individuals whose service to the people of northern New England best exemplifies Robert Frost’s values of individuality, hard work, humanitarianism, and devotion. View past recipients and contact the Alumni Relations Office at alumni@plymouth.edu if you have a suggestion for a candidate for this award.